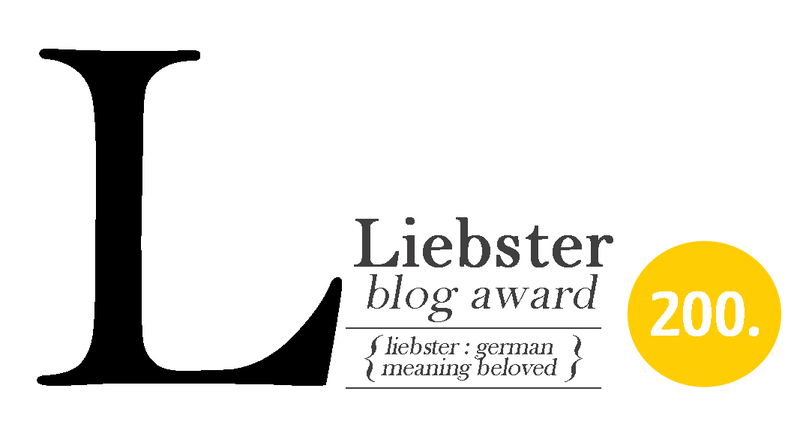 Beware – maker on a mission! 30 years ago I tore my medial ligament whilst proving outdoor bravery to my boyfriend (now husband). The thing is I never did sport at school, I was a ballet dancer. I knit, I embroidered, I was not brave! We lived in London at the time. I was confined to quarters for 3 weeks, thankfully I had an aged Singer to keep me company. I also had a good hunk of silk/linen mix and a Palmer/Pletsch pattern. 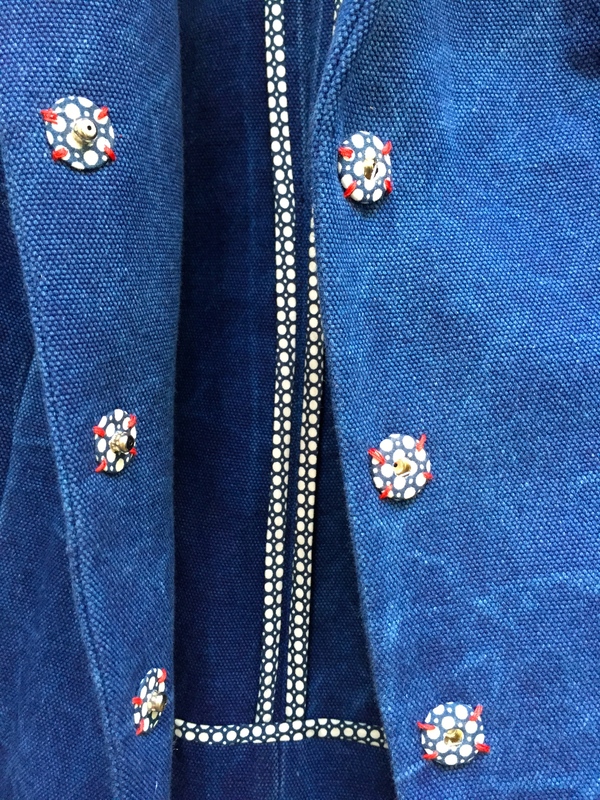 It took me the whole 3 weeks to make the most perfect jacket, apart from the sleeves being too short, but it was the early 90s – we were still pushing them up our arms rockstar style. I have recognised an early propensity for self sabotage in sewing – it persists. I hacked right through the back princess seam on the jacket below. It was all but finished. I hate making jackets and I’m not sure if its the chesticles having got even bigger and/or lower, the holy grail of a well fitted slim sleeve despite ever increasing bicep width or my delusional state. There is no doubt that sewing for older me is more challenging than sewing for ironing board shaped younger me. Perhaps my expectations are just so much higher. “I wanna be an artisan” she wailed. Just over a year ago I made Vogue 8333, a Claire Schaeffer pattern. wrinkled after 1 year in a suit bag! 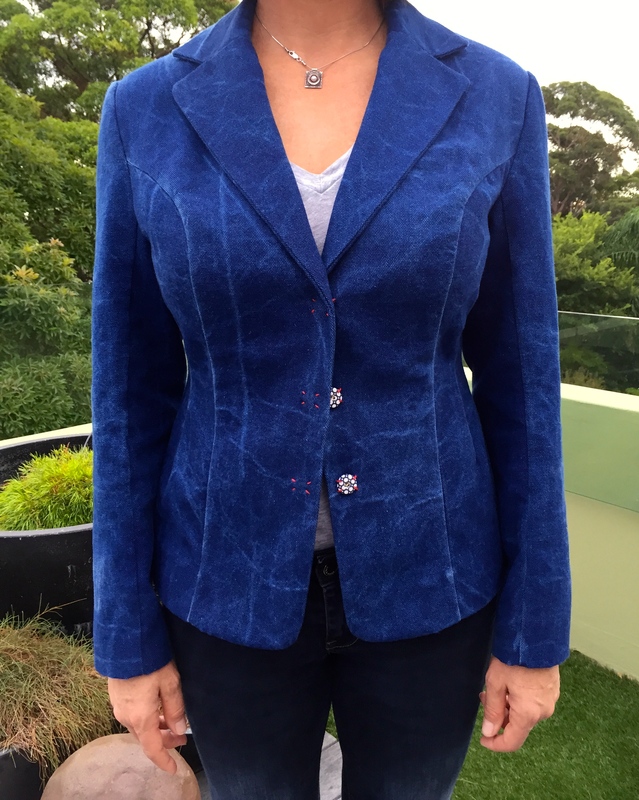 I had visions of my beautiful azure cashmere melton becoming the perfect jacket. The fabric was way too heavy, the jacket looked less like wonderfulness and more like a manly shouldered 80s Dynasty assemblage. I had used the requisite couture techniques and just observe, if you will, the beautiful pick stitching on the discreet pocket! You can’t see the hours of padstitching etc. but its in there! My kids laugh when I put it on, “its so retro Mum”. Do they mean I’m ‘retro Mum’?! So despite being expensive cashmere and Liberty lined loveliness I have never worn it. This is a completely (I needed to emphasise that! ), completely, self drafted jacket which I wish wasn’t an armhole princess line, I would prefer a shoulder princess now, less bulbous, more lengthening. But anyhow, this is where I’m at. 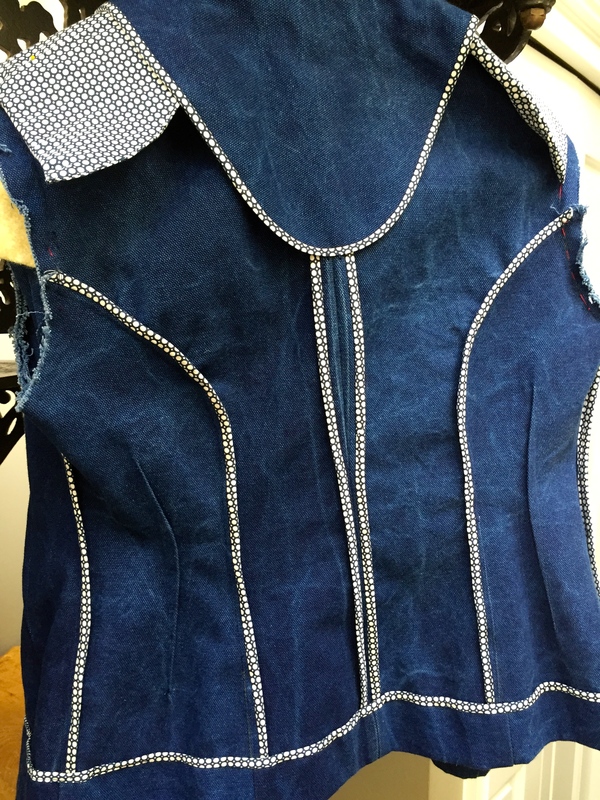 I made the pattern under the watchful eye of Anita at Studio Faro during her tailored jacket patterns class. This, above, is actually a toile, but I thought it might be ok to make up since its predecessor looked quite close to being right. Its not terrible considering the fabric was $5/m, cotton canvas. After washing, the fabric became marbled, which I loved, so I mistreated it some more! Arghh, take that and that, she says whilst brandishing sandpaper… more distress! The best part of this jacket are the covered snap closures – aren’t they great? Little did I know that bound seams weren’t a time saver, bagging a lining would have been quicker. The sleeves are temporarily inserted because I think I need some help with the sleeve head shape, it just doesn’t look right. I’m off now, to make some more adjustments to the pattern V3.0. Remove about 2cm out of that space above the chesticles, my push ups (exercise, not bra) aren’t doing sh*^! I’ll also raise the underarm point by 1cm. I tried this by pinning the shoulders up and I can move my arms more freely – not for volleyball this jacket though! I use the Kenneth King method, he calls it ‘the grid’. Let me know if you’d like a demo of this, I had always wondered how people took excess out of patterns. This post has wonderful visuals, illustrating the why and how of armscyes and sleeves.We’d expect no less from a physics teacher! Let me know what you think about tissue boxes and toilet roll innards now! I’ll leave you with a close up of covered snaps. I’ve got sticking and glueing to do. TRAPPED IN SEWING DUNGEON – SEND HELP! That is one beautiful jacket. The fit looks spot on in the photo, but I know when things are worn they move about and show up fitting faults so your adjustments are probably necessary. But meantime you should be very proud. Well done! KaSchu, you’re too kind, thanks for reading. In real life it has some vertical folds mid shoulder. Fingers crossed the next version fixes that. I have that CS pattern too and have been tempted – I actually really like the retro jacket, except the top stitching. In terms of your self drafted pattern – it is a great achievement and well worth keeping at it. I absolutely sympathise with wanting a perfect fit. Why settle for less? You have done an amazing job. And the bound seams in lovely contrast cotton – I have always avoided that as it seems like such a lot of work when a lining feels so nice and hides so much. And the press studs are super. Just great. I think it will work even better in wool. I think the reason I finish ill fitting garments so nicely is so that the person who buys it from my charity shop enjoys it! That thick material just wouldn’t lie flat, I succumbed to topstitching. The CS pattern is a gem, the pocket is so interesting, I’d suggest a nice fine woollen though! Hiya, I’m afraid I’m stalling on the next one. I’ve got an injury and haven’t exercised for a month. Nothing like extra padding to make one reluctant to nip tuck! Hah, running was not something I evervattempted until I bought an amazing sports bram, it’s a Freya w no underwire. Unlike any predecessor! So good I gave myself a foot injury, way better than black eyes though! I will post about the grid, it worked so well I was truly surprised! Those details are inspiring! And, I LOVE seeing a well fitted blazer on curves. Thanks for sharing it. Thanks Najah, curves suit jackets I think. Hopefully worth the tribulations getting there! I love both jackets! 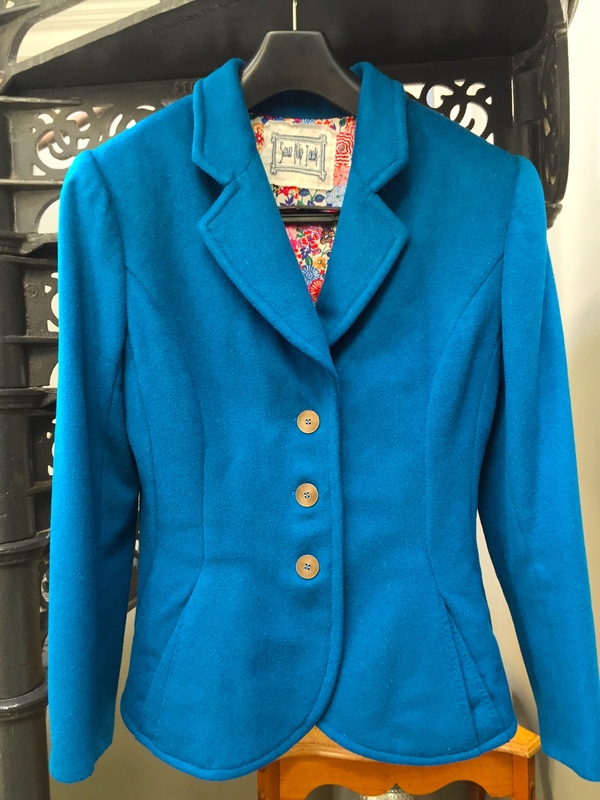 I would definitely wear the cashmere/Liberty jacket it is lovely…maybe new buttons?? I wish when my material marbles in the wash I could see it as a positive thing….instead I see RED! Red!! Perhaps the next one! !